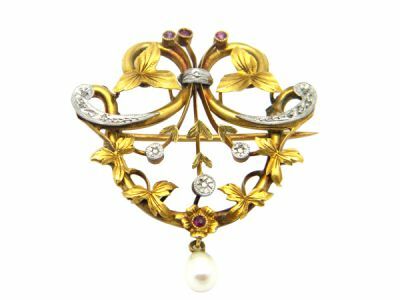 Intricately designed Art Nouveau brooch is custom made in 18 kt yellow gold and platinum with a floral and foliage motif. Set with 12 rose cut diamonds and four rubies, it features a 4.30 mm drop shaped pearl. Classic C clasp and some visible solder.